Flaxseeds have been used to cure many diseases since ages! It is also known as Linum usitatissimum, meaning “the most useful.” Flaxseed is popular all around the world and is also considered as “superfood”. It is rich in fiber, antioxidants and omega 3 fatty acids. Plant components called Lignans have antioxidant and estrogen properties. These properties of Lignans can help lower the risk of cancer and improve the condition. Including flaxseeds in your diet can reduce the chance of hardening of arteries. Lignans can reduce the deposition of plaque in the arteries. The amino and omega 3 fatty acids present in flaxseed can reduce high blood pressure. The soluble fiber content present in flaxseeds helps to reduce the appetite. This property of flaxseed reduces digestion thereby reducing food intake and manage weight. ALA and lignans are two components that can reduce the inflammation. Plant compound ALA has been considered to decrease inflammatory reactions in humans. Lignans can decrease levels of several pro-inflammatory agents. The omega 3 fatty acids found in flaxseeds increases the healing speed. It minimizes skin irritation, rashes, inflammation and other skin related problems like acne, dermatitis, and psoriasis. Flaxseeds reduce the possibility of dandruff, eczema and other scalp conditions due to its anti-inflammatory properties. It increases the elasticity and reduces hair breakage. Flaxseeds contain insoluble fiber that has lowers high blood pressure. Studies say that insoluble fiber content found in it slows down the release of sugar into the blood. Flaxseeds are rich in protein. If you are planning a vegetarian diet then including flaxseed in your diet can help you a lot. Flaxseeds are rich in fiber which helps in lowering cholesterol and plays a significant role in improving heart health. 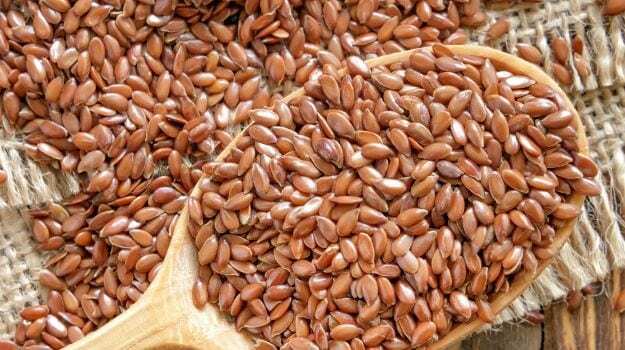 Flaxseeds can also be beneficial for people suffering from Poly cyst ovarian disease. Daily consumption of flaxseeds can improve the condition. It reduces testosterone levels and improves lipid profile which is important in managing PCOD.